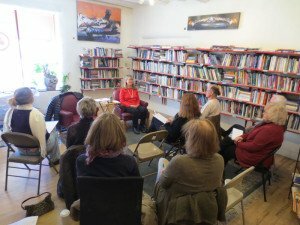 A Conversation with All That Is through Anne Salisbury with Greg Meyerhoff at OptiMysm Book Store in Taos, New Mexico. What is a Conversation with All That Is? From an early age, Anne has been seeing and hearing things that no one around her did. She kept these vivid conversations with “All That Is” to herself until recently. These spiritual guides are non-physical beings who focus on self-acceptance, love and spiritual growth. They provide energy assistance to those who make the choice to enter into communication with intuition. What does my higher self want me to know? What is happening in the world around me? How can I create what I really want? These answers open your perspective so you can view yourself in a more expanded way. This can lead to true transformation. Since everything involves relationships, whether it is with yourself those around you or the energies in your environment, the more you can appreciate yourself the better all of your relationships can be. This is a typical channeling event that includes a variety of questions and answers. Listen now to this 45 minute Conversation with All That Is through Anne Salisbury, PhD with Greg Meyerhoff. It is from a channeling given January 5, 2014. “How should you approach a new year?” That begins the conversation.